One of the most important topics I studied in business school was system creation. From your local Mom and Pop, to Fortune 500 companies, businesses all share the need to develop systems that lead to success. My advice to readers would be to establish an automated system to assure lasting wealth creation. No matter your income stream, a clearly defined process for the money flow in your wallet can take the short-term struggles and temptations out of saving and investing. Let's assume you get paid twice monthly. I don't want to lose any entrepreneurs that have irregular income streams, so this will work for you as well. -Savings account with sub account options (Best option here is Capital One "360", formerly known as ING Direct. Contact your HR department and request a predetermined percentage of your paycheck be "auto-deducted" into your company's 401k plan. Ideally, your company offers a match of your contributions. If your company matches 3% of your salary, select 3% for now. We'll return to this in a moment to see if increasing this further makes sense. 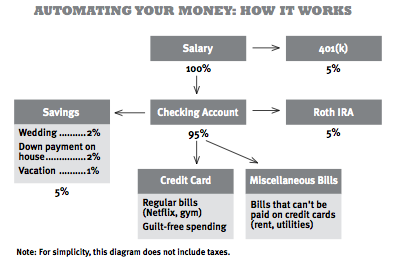 Establish a direct deposit of your paycheck into your checking account. No one has time to deposit checks at the bank anymore, so save yourself the bi-monthly trip. Determine your monthly expenses. An incredibly important piece of any sound financial plan is an emergency savings account with 6 months of expenses available in case of job loss, medical emergency, family emergency, car repairs, etc. This account should not be touched unless its an extreme emergency. So if you spend (not including investments) $3000/month, your emergency fund should have $18,000. Capital One will allow you to set up an auto-deposit from your checking account into each of the sub savings accounts. A number that sticks out in my head is 5% of gross income, but each person's financial picture is different. Contact your ROTH IRA company, and set a fixed monthly auto-investment amount in line with your current income and expense levels. The 2013 monthly maximum is $458.33/person. If you are married, this figure would be $916.66. The ultimate goal would be to max this out, and if any room were left in your budget, put the remainder in your 401k up to a monthly amount of $1458.33, the monthly max for 401k contributions. Set any recurring monthly bills (cable, phone, gym membership, netflix) to be auto billed to your credit card number. This way you will earn miles/cashback rewards on these purchases, which will really add up over time. All other spending, such as groceries, gas, restaurants, etc. should also be paid for with credit card. Pay off your credit card in full at the end of each month. The best way to do this is to set up an email notification for the 30/31st of each month, and use this to review all purchases and pay off full balance. I can't stress enough the importance of paying your card off in full. More on this in later posts. In the rare instances where a credit card cannot be used to pay a bill, use your bank's "e-bill pay" feature, where an electronic check is sent to an address you specify. This can be automated as well to assure important obligations like rent are not missed. For "cash only" businesses and miscellaneous spending that isn't supported by bill-pay or credit cards, ATM withdrawals will take care of the rest. And there you have it! The above guide will position you to "set it and forget it" when it comes to your personal finances. The only goal you should have once this system is in place is to be committed to increasing your savings rate over time. Your ability to control spending will make or break your long-term success, so do your best to eventually get your savings rate to 30% of your gross income (before taxes). BUT DON'T FORGET TO HAVE FUN TOO! NOBODY LIKES A MISER! Your very welcome! it's nothing new, but I felt it was good information to share. Thanks for your feedback!